Symmetrized shape handle fits right or left hand. Recycled ABS plastic handle for firm rip and comfortable fit. With hanging hole. Resists rust and corrosion. 150mm overlength, 55mm cut length. 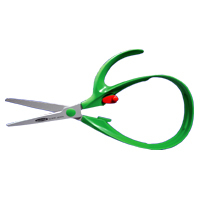 Lightweight, high-quality home and office scissors. 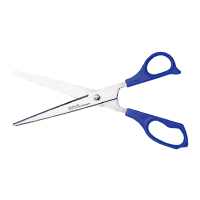 Offers sharp cutting performance and durability. Rust and corrosion-resistant, precision-ground. Blades have inside, edge and bevel grinds to retain their sharpness. Blunt point for safety reason. Recycled ABS plastic handle. 199mm overlength, 85mm cutting length. 45g. 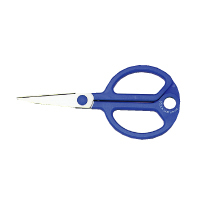 Adhesive-free scissors. Fluorinated blades to cut adhesive tapes with ease. 170mm overlength, 75mm cutting length. 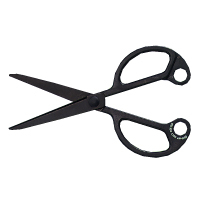 Heavy-duty scissors with ergonomics design. Tough hard stainless blades and glass fiber reinforced ABS grip. 220mm overlength, 115mm cutting length. Circle-shaped spring-action handle designed to reduce fatigue and hand discomfort. 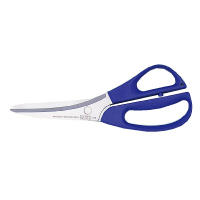 Extra-wide, contoured handle will enable handicapped and elderly people to cut efficiently and comfortably with minimum effort.Accommodates variations in hand and grip size+power. Lightweight. Blunt point. Adhesive-free, corrosion-resistant. Fluorinated stainless steel cutting blade excellent for cutting adhesive tapes and labels. Left- and right-handed. Overlength: 215mm, cut length: 63mm. 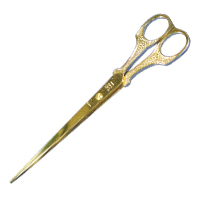 Gold-plated stainless steel scissors. 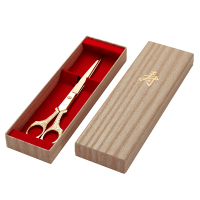 Ideal for cutting ceremony tapes. 260mm overlength, 100mm cut length. 75g. Packed in paulownia wood box.